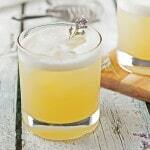 Have you had a proper gin sour? Man are they ever good! 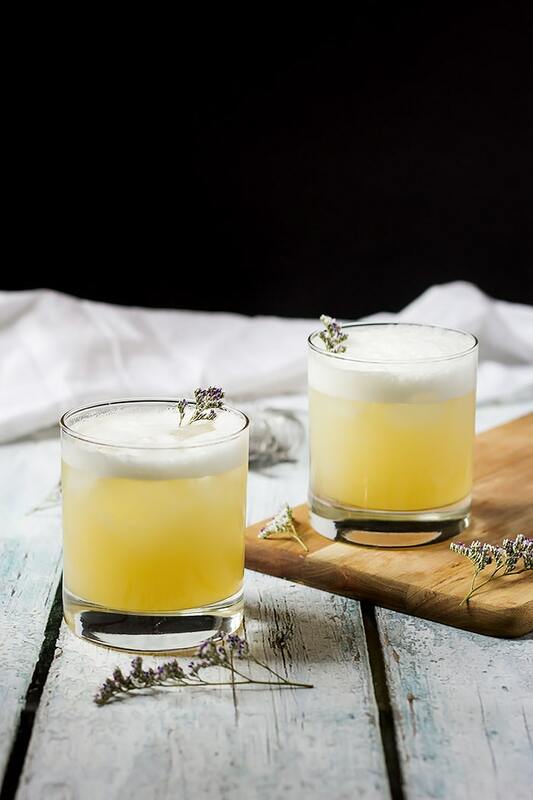 And since they are so good and since we have been talking about Mothers Day brunch this week, we think you should consider serving this Elderflower Peach and Lavender Gin Sour to your mom when you invite her over for brunch on Mothers Day. She will love it. It’s the perfect blend of sweet and sour with a slightly floral note. Plus, aren’t they so dang pretty? We just had our first Gin Sour a couple weeks ago. 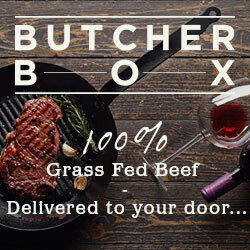 We are totally hooked. A sour is a traditional cocktail that dates way back before prohibition. It has a base liquor, lemon or lime juice, a sweetener, and usually egg whites. 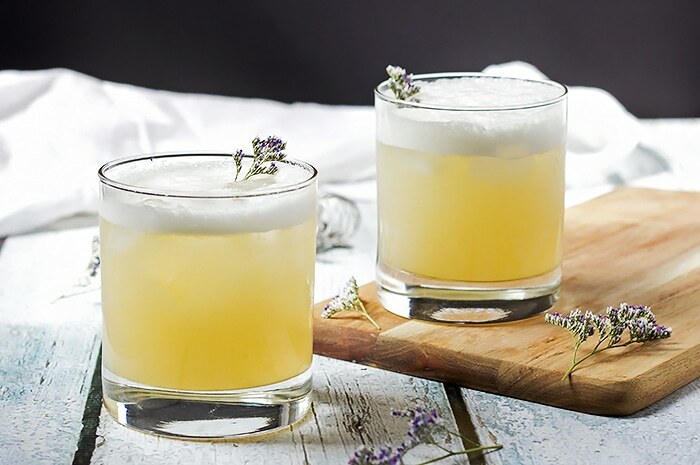 In this cocktail we use Gin as the base with a little elderflower liqueur thrown in, lemon, peach and lavender shrub (which is a type of vinegary syrup – I will explain later) and egg whites for a silky finish and lovely froth on top. I will also say that the products we tasted from Gillespies were incredibly good! They have two kinds of vodka, one that’s called Gastown Shine which we loved! It has an almost caramel flavor. The other was called V-twin that was a little too biting for us, but whiskey drinkers would probably like it. Their limoncello just won an award and it is delicious! They have a fun flavored vodka that is like nothing I have tried before infused with well known aphrodisiacs cacao, chilli and vanilla. Its wonderful. And finally their gin, which we were surprised that we liked. Its like no other gin I have tasted before. A shrub is basically a syrup with sugar and vinegar and then some sort of flavoring. They really deserve their own post, but that is the basic concept. The end result is a sweet and fruity syrup with a vinegar kick. You only use an ounce or two in a cocktail, but the flavor that you get is slightly sweet and sour and totally awesome! Add the peaches, lavender, sugar, and vinegar to a medium pot and heat on medium heat. Bring the mixture to a boil and mash the peaches while you stir it. Once the mixture has come to a boil, turn off the heat and let it cool completely. Strain and store in an airtight container. A mason jar works great! Add all the ingredients to a martini shaker and shake well. 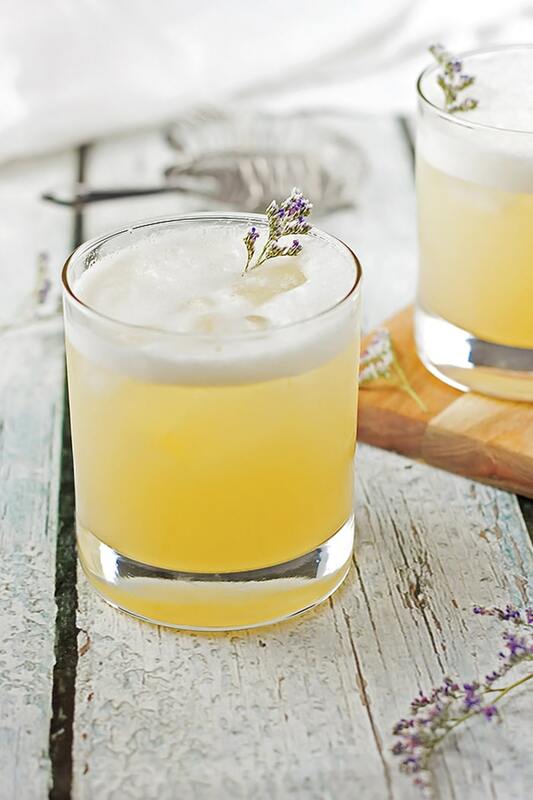 Pour into glasses and garnish with a sprig of lavender. Add the peaches, lavender and sugar to a large mason jar or a bowl. Mash the peaches up a bit. Then let the mixture sit in the fridge for at least a few hours or up to a couple days. Strain the juice and add the vinegar to the juice. Shake or stir well and thats it. I love a good sour and more than that, this recipe has my absolute favourite flavours, elderflower and lavender! Cannot wait to give this a god.